For years, I would joke with colleagues and friends that I am a “nester"—at home and in the office space as well. I have always liked having a work desk that reflects who I am, unabashedly: a card I got from my father the first day I started working, a to-do list writing memo pad, a print of If by Rudyard Kipling, a set of succulents that have been carefully nurtured for almost five years. I have moved a few jobs now and obviously a few office spaces—from an industry association which epitomized the post-colonial filing-every-scrap-of-paper culture to an aspiring paper-free, zero-waste international conservation organization. As a consultant in my early 30s working on environmental sustainability and conservation management, somehow, I have always been lucky enough to find the space to create these work “nests" everywhere that I have ever had to call my desk. So, when a then-soon-to-be colleague joked that nothing would prepare me for the move I was about to make, I dismissed it as simply as her own culture shock from having recently moved from Switzerland to Bangladesh. I remember responding with a smug “Tch, all of South Asia is home to me, I’m not too worried and nothing will be strange." I assumed, naïvely, at the time that she was referring to things like the daily commute struggle in Dhaka . However, maybe in a more profound way it was a reference to the role of international consultant that I had just taken on. Unlike all my previous roles, this time I was not really a part of the local team any more and I had no fixed office, so to speak. I was part of the New York team that I never met, guiding a Bangladesh team. Since I was a “visitor", in all likelihood, I knew, there would be no fixed desk space assigned to me. But I was definitely not prepared for a desk on a bed on a boat to be my office. Sailing in the SoNG— Bangladesh’s first protected marine zone. Ten days after I joined in December 2017, my team and I left for the Marine Megafauna Survey 2017-2018, which the organization I had just joined was conducting. The survey retraced the original transect lines drawn along the entire coast of Bangladesh in 2004. That original effort had discovered the world’s largest population of Irrawaddy dolphins, the small beakless marine mammals that frequent the country’s coastal waters. In those 40 days last year, I found that all these ruminations about physical office spaces and situating myself in a team, were just things I had attached too much importance to. There was no room for anything extra on the boat—no poetry and no succulents. In fact, even drinking water was rationed, as was time in the single shared toilet. The survey team had to carry out the research across a distance of more than 1,500 kilometres. 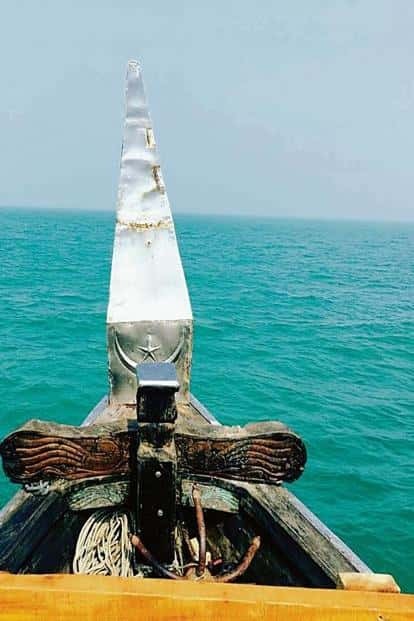 The office space, home space and recreational space were all included in two traditional local fishing boats—FB Manikjaan and FB Jobeda—which had been modified to accommodate the survey team of about 10 people and the fishing boats’ crew of about six. Both the boats were equipped with basic navigation and communication equipment. Communication between the boats took place on a VHF radio where in this grand gesture of romance, FB Manikjaan (a typically male Bengali name) would call FB Jobeda (typically a Muslim female name), or vice versa. I still remember the first day on the boat: sea sickness, the excitement of being in a never before, never again Life of Pi situation, the smell of the sea, clear skies, the salty wind in my hair and the need to use the loo. The toilet was a hole at the back of the boats—more like an open triangle inside a box in the aft of the boat. The first time I threw up, I tried to keep a straight face and walking to the toilet, it didn’t particularly help. The next time I just shamelessly bent over the side of the boat. The crew had seen it all and by the fifth day, the entire team had thrown up at least once in full public view. The sea sickness went away after the first three days, and I have to admit that personalized desks seemed a lot less important than firm footing in the toilet, from this vantage point. The day’s routine would be simple, starting with the first light and breakfast after which all of us would work primary research through the day, then work on data through the evening till there was light. Sometimes there would be network and we would call home on phones we had charged with a solar battery pack through the day. The survey effort itself was largely a success but the absence of a physical space to call “my" own continued to bother me through my time on the boat, more in a niggling sort of way than an overwhelming one. I did not want to create my own space on the boat, but I did want to find “quiet", which is particularly difficult in a situation like this. I found myself confused by this, given that I am otherwise an extrovert. While I enjoyed the team spirit that this intense experience fostered, I have to admit that most of us went through it knowing that it had a clear timeline and would be over in 40 days. Every now and then, I would joke with the team when we crossed into Indian territorial waters, that I was going to call the coast guard and go “home". For me, the most critical lesson to draw was that the human mind has an immense capacity to create and to cope with situations that are tedious. You learn to tell yourself what to expect, what will get you through and you can train yourself to adapt to any situation you are in. Sometimes, it would mean staying up longer than everyone else to manage quiet time, often it would mean zoning out of meal-time banter. I returned to an office 40 days later—succulents, planners, uninterrupted power supply, and recycled paper and all. As cliched as it may sound, my time on the water seemed like a lifetime of talking about sustainability, the environment and climate change, collapsed into this short snippet of shared time and experience. Have I ever been more inspired? No. Did I miss the most random things that I take for granted like being able to charge my phone whenever I want? Yes, of course. Would I trade the experience for anything? Hell no! Familiarize yourself with the space. Find “your" spot—this could be a quiet corner or a place with the best view or someplace where you are the centre of attention—depending largely on who you are. Keep a torch, an insect repellent, a good book, music and a solar phone charger handy...always. and beauty is at its very best if you’re looking. Learn to keep yourself in a positive frame of mind. Neha Simlai works with a marine conservation project in Bangladesh.